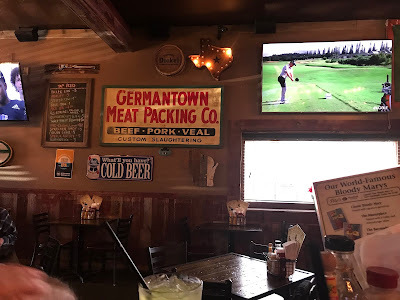 Recently, the hubs and I were looking for someplace to go for lunch on the weekend. We have our staples of Culver's, Taco Bell, and Cousins, but I wanted something different. I pulled the discount card off the fridge (thanks to the Waukesha West Baseball team) and saw Sobelman's on there. I convinced the hubs that we should try it as neither of us had been there yet. The location of Sobelman's in Waukesha has been quite a few things in the past couple of decades. When I went to Carroll, it was Mulligan's, a popular college bar. After my college years, it became a few other bars before becoming a country bar that then turned into Sobelman's. 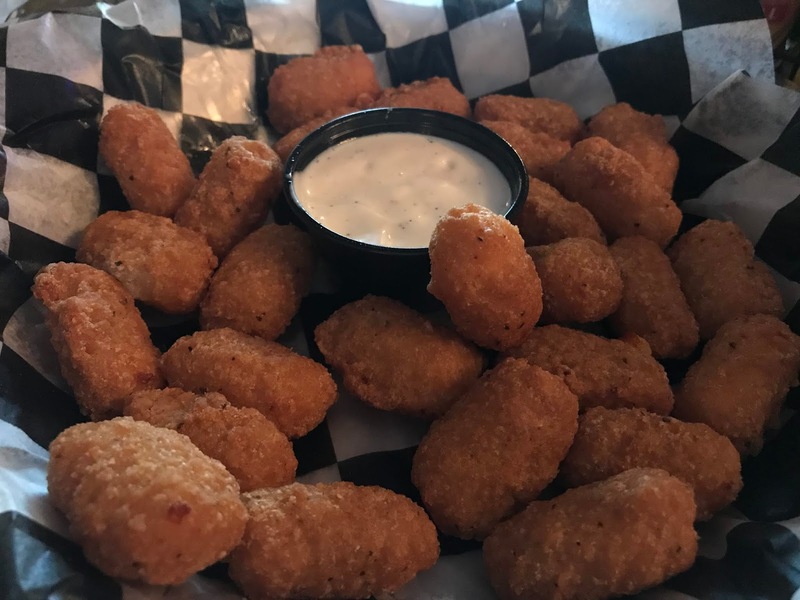 The owners of Sobelman's Waukesha also own Boscos Social Club in downtown and I went to college with one of the owners and had friends in a similar circle. It's awesome to see that they stayed local after college and now have successful businesses in the city. When we walked into Sobelman's, the first thing I noticed was how different it was from the college days. The bar used to jut out in the room and take up a ton of space. Now the bar is L-shaped allowing for more tables for dining. They added cool rustic lighting with mason jars and lots of local vintage signage. We grabbed a high top table in the middle of the place and were promptly greeted by our server. We showed our coupon for free cheese balls right away and she told us it was a great choice. I ordered a cherry coke and the hubs ordered a Mt. Dew copycat called Mountain Mist from Dang! That's Good soda company (from Milwaukee!). It wasn't Mt. Dew, but it was still good. And my cherry coke was made with grenadine - delicious. 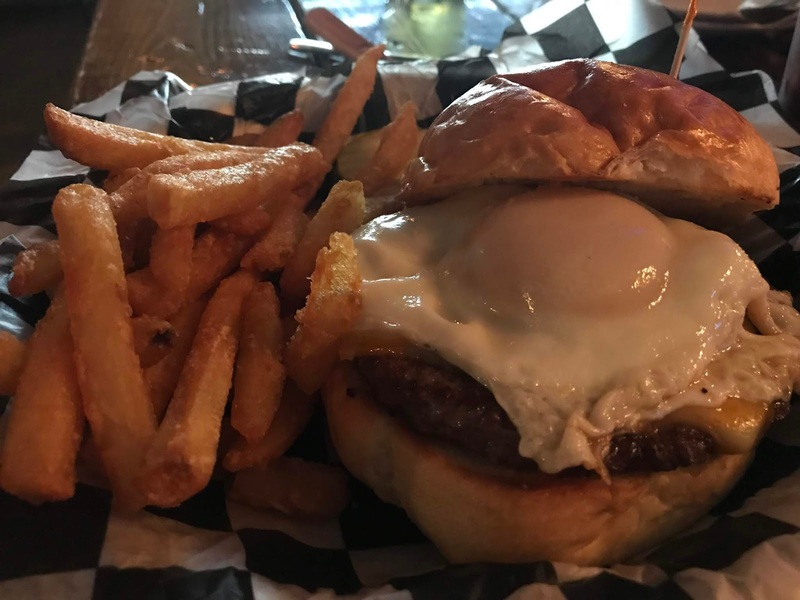 Sobelman's is known for their awesome burgers and has even made national TV shows with a local burger battle in Milwaukee. 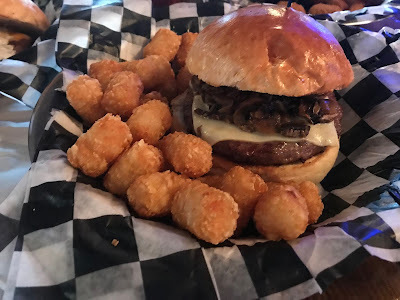 I am a sucker for a Mushroom Swiss burger (my go-to at Culver's) so I had to try theirs. The hubs went for The Hangover (though he didn't have one) and just said no to the onions. Our cheese balls came out wicked fast and oh man were they good. "No cheese ball left behind" was our mantra because we didn't want any of the cheesy goodness to go to waste. The cheese is breaded in a delicious coating and then deep fried. The ranch that comes with is awesome and the pairing really got our buds going. We ate about half the order before our burgers came. The burger patties are flatter than other places in Waukesha, but with how they pile on the toppings, you still get a huge sandwich. (Is a burger a sandwich?) The buns are nice and buttery on the outside and soft on the inside. My burger had more mushrooms on it than I have ever gotten and they were sauteed perfectly. The cheese was melty and the whole pairing worked really well. I ate half the sandwich as is, and for the second half, I ate just the burger and toppings because I was too full to eat the bun too. The pickle slices on the side are nice, super crisp, and dilly. The hubs burger looked amazing - one smush down on the sandwich had the fried egg running all over. He said it was cooked perfectly and it added egg to every bite. The sandwich also had cheese and bacon. He devoured the entire thing and was very impressed. Our server was extremely attentive and we never ran out of beverages, had plenty of napkins, and she made sure we liked everything we got. She even chatted with us a bit about their other specials and how awesome it is to work for this company. Most servers don't take that kind of time any more or say it nearly as sincerely as she did - so that awesome to hear and something I wanted to relay. Sobelman's is known for their Bloody Mary's and even has one with an entire fried chicken on top! We didn't try any that day--me, because I'm expecting, and the hubs, because he didn't think he needed a third lunch that day :) (They really can be meals in themselves, can't they?) But we are definitely going to keep this place in mind for lazy Saturdays and invite some friends for Bloody Mary's and a great meal. They also have wing night on Wednesdays and Fish Fry on Fridays - plenty of reasons for us to go back. And if it wasn't for that coupon to get us in the door the first time, I'm not sure how long it would have taken us to try this gem. Whisk is a culinary collective of Wisconsin based food bloggers.